The Schwartz Value Focused Fund is an equity mutual fund, which seeks long-term capital appreciation through value investing. The Fund managers purchase shares of strong, growing companies at reasonable prices. They may invest in the securities of companies of any size. Performance data quoted represents past performance, which is no guarantee of future results. Investment return and principal value are historical and may fluctuate so that redemption value may be worth more or less than the original cost. Current performance may be lower or higher than what is quoted. Visit www.schwartzvaluefocusedfund.com or call toll-free 1-800-449-9240 for the most current month-end performance. For standard performance information please click on the “Quarterly Fact Sheet” above. Performance can be affected by market and investment style risk. The Fund’s investments in small- and mid- capitalization companies could experience greater volatility than investments in large-capitalization companies. 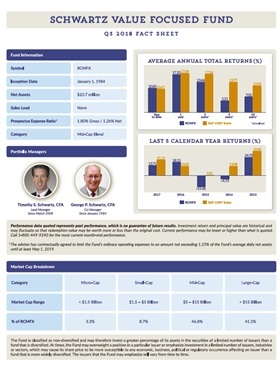 The investment performance assumes reinvestment of dividends and capital gains distributions. The quoted performance for the Fund includes performance of RCM Partners Limited Partnership for periods prior to July 20, 1993. It should be noted that: (1) the Fund’s performance includes performance for periods before the Fund’s registration statement became effective; (2) the Fund was not registered with the Securities and Exchange Commission and, therefore, was not subject to the investment restrictions imposed by law on registered mutual funds; and (3) if the Fund had been registered during such periods, performance may have been adversely affected. The S&P 1500 Index includes all stocks in the S&P 500, S&P 400, and S&P 600. This index covers 90% of the market capitalization of U.S.stocks. Indexes do not incur fees and it is not possible to invest directly in an index. Mutual Fund investing involves risk, principal loss is possible. The Fund’s investments in small- and mid- capitalization companies could experience greater volatility than investments in large-capitalization companies. Prospective investors should read the prospectus carefully and consider the Fund’s investment objectives, risks, charges and expenses carefully before investing. The prospectus, which can be obtained by calling 1-800-449-9240 or online at www.schwartzvaluefocusedfund.com, contains this and other important information.